The Root River system began forming about 20,000 years ago when Wisconsin’s glaciers began to retreat. Starting in eastern New Berlin, it flows through southwest Milwaukee County before entering Lake Michigan at the city of Racine (French for “root”). Teeming with fish and game, the river and its drainage area drew many Native Americans. The last, the Potawatomi, were here until their departure by treaty in the 1830s. Later residents of the area now within the city of Greenfield found “more than a bushel basket” of stone artifacts and a copper tool from ca. 3000-500 BC, “innumerable little Indian heads as short as an inch and the largest were 4-5 inches long,” as well as a trove of projectile points that was uncovered by a young boy during the 1950s. 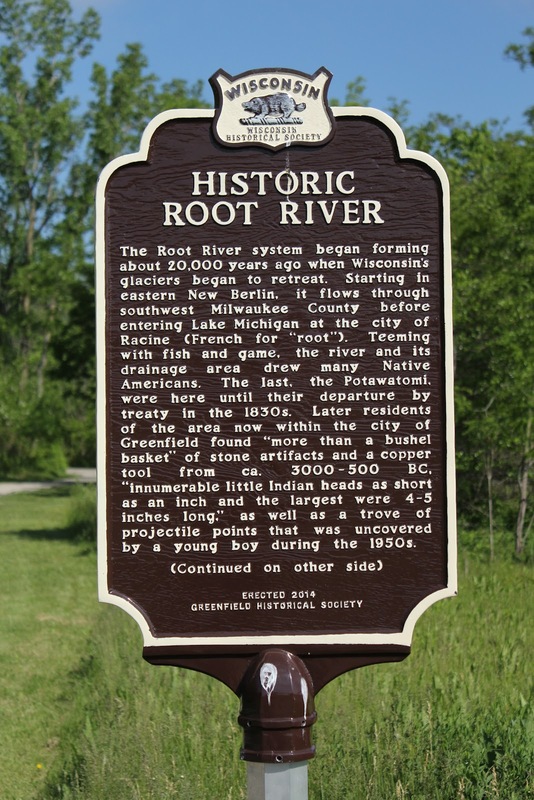 The marker is located along Oak Leaf Trail and is accessible from westbound West Beloit Road, west of its intersection with South 108th Street / Wisconsin Highway 100, at or near 11000 West Beloit Road, Milwaukee, Wisconsin 53228.